The second major country of Iberia, Portugal is the westernmost nation of western Europe, and another	of the continent's great former imperial powers. Such was Portugal's influence that the Portuguese	language is still the sixth most common native tongue in the world, largely accounted for by its colonial	legacy in Brazil. Portugal didn't fare very well in the economic crises of 2008-2013, however	with its good weather and steady tourist industry, things are looking fairly bright. We spent three nights in Lisbon on a last-minute deal, with very civilised flights on KLM from Edinburgh. For September I was expecting it to be a little warmer than it was, but it was still very pleasant	wandering around the old town in t-shirt and shorts. Our hotel, the VIP Grand Lisboa, had an odd	design of window between the bathroom and bedroom, but was comfortable and looked far less daft than	its namesake in Macau. 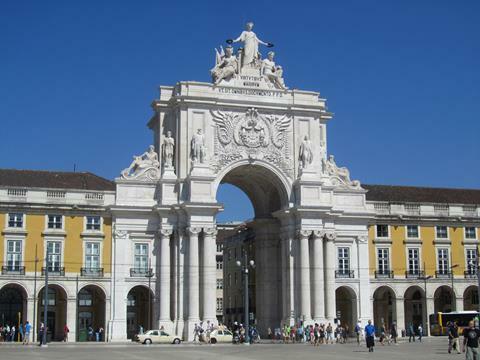 Lisbon's Triumphal Arch, the Rua Augusta Arch, marks the entrance to the city for travellers arriving	on the banks of the Rio Tejo. It is older than Paris's Arc de Triomphe, or at least parts of it are,	as it took well over one hundred years to build. The square it fronts is called Praca do Comercio. 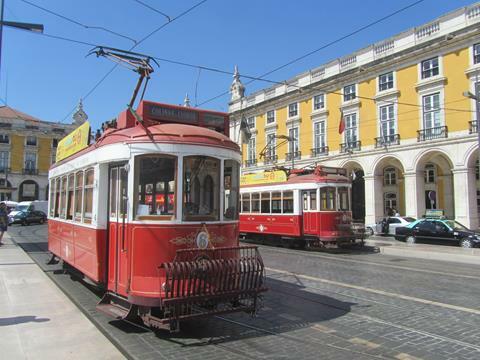 Trams still ply the streets of Lisbon today, and are enough of a symbol of the city that they appear	on postcards and souvenirs. 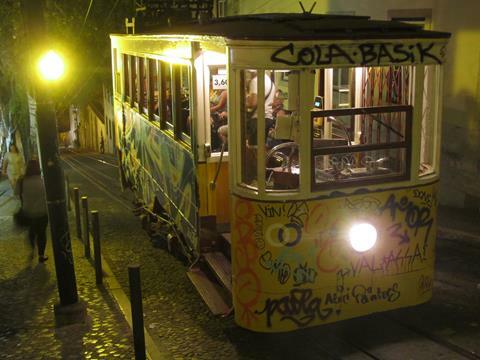 Lisbon, like Gothenburg, was sensible to retain its trams, unlike British cities and most notably Edinburgh which has recently completed a single line at enormous expense. 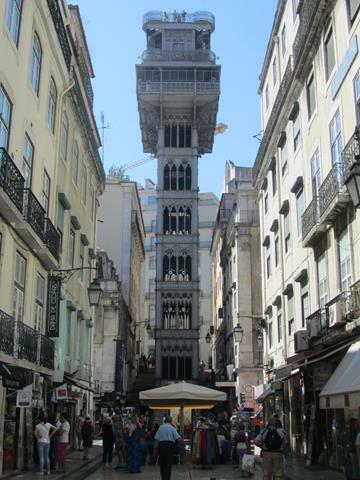 Santa Justa Elevator lifts lazy punters out of the bottom of Baixa and up to the hillside district of	Bairro Alto. Starting as a modern convenience in the late 19th century, it is now a tourist attraction	in its own right, with prices and a queue to match. You're quicker walking. 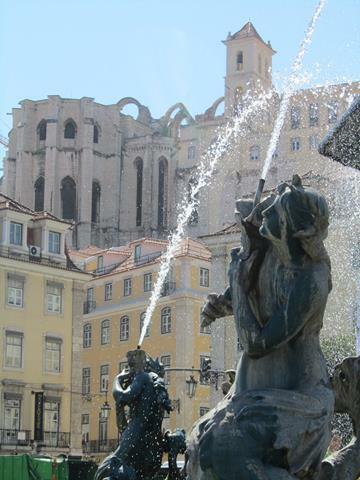 Fountains on Rossio Square with the arches of the partly ruined Carmo Convent in the background. The	building sustained this damage during the Lisbon earthquake of 1755, one of the most powerful and deadliest	to strike Europe in human history. The building stands as a monument to the event. 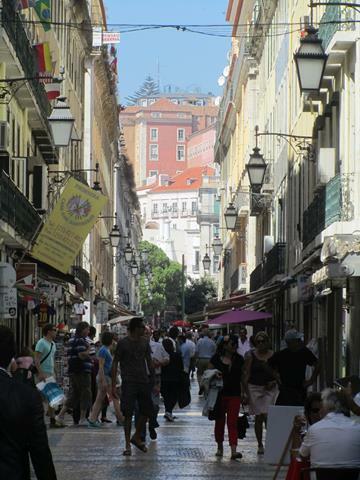 Typical Chiado street, this area between the hills of central Lisbon is called Baixa, being at the bottom	of the hills as it is. We spent plenty of time wandering the streets and sitting in multiple cafes,	a different cafe for each course of our afternoon grazing. 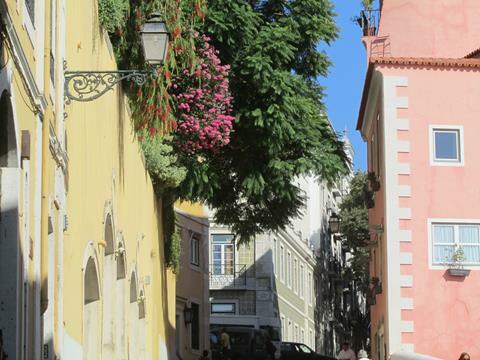 Pretty pastel coloured houses spotted whilst wandering the streets of Alfama towards the castle. It's	scenes like these that keep drawing me back to the Mediterranean. 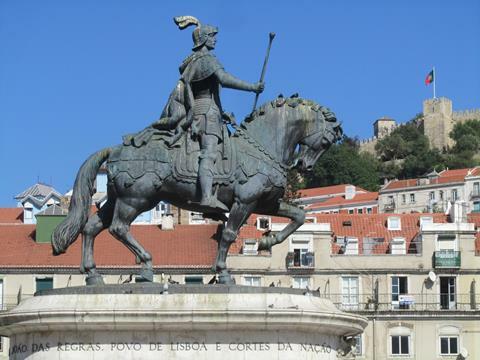 Here comes the equestrian statue, prancing up and down the square of Praca da Figueira. He is King	John I, and his square only came into being after the devestation of the 1755 earthquake. 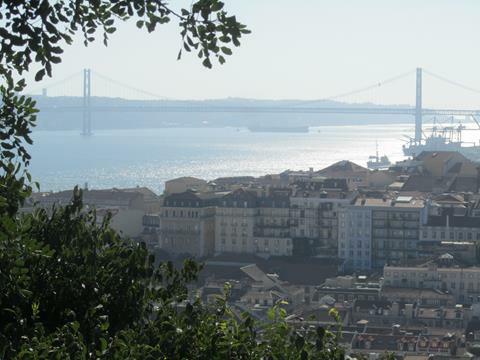 We took a mixture of lifts and stairs to get to the top of the hill in Alfama, and were rewarded with	sweeping views back across the Rio Tejo. In Spain the river is known as the Tajo, both names sharing	the Latin root Tagus. I realised I had seen the Rio Tejo previously on my visit to Toledo. 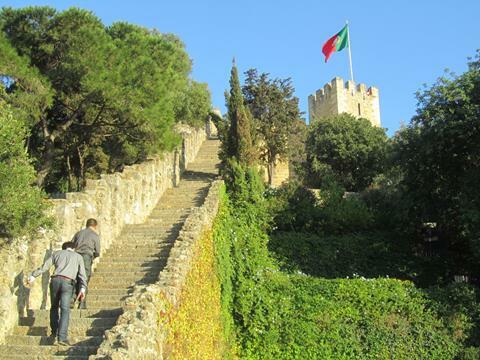 Sao Jorge Castle sits atop the hill of Alfama, and is an excellent vantage point for seeing much of	Lisbon spread out below. The castle itself used to be the royal residence, and has been nicely restored	with some precarious wall sections to explore. 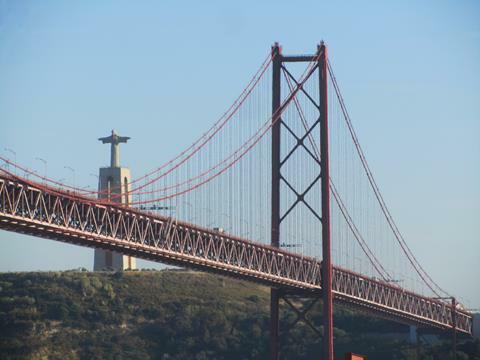 The 25th of April Bridge is Lisbon's version of the Golden Gate Bridge, although it was in fact modelled	on the Bay Bridge. As an engineer, I was very interested to learn that it was retrofitted with	a second deck for railway in 1999. The bridge strengthening included increasing the height of the	towers and running a second set of suspension cables above the originals. 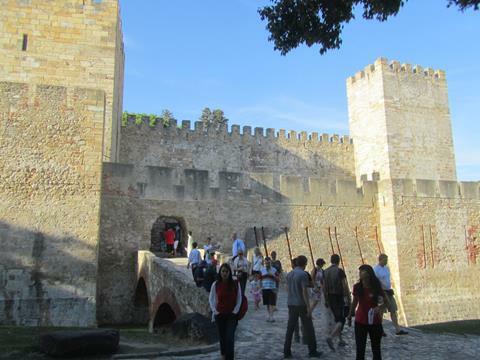 Wandering the walls at Sao Jorge Castle was fun but tiring, so we went for an ice cream soon after. A tired tourist has a well deserved break at the castle lookout over the Rio Tejo. The elevators may	save some hill climbing, but not all of it! 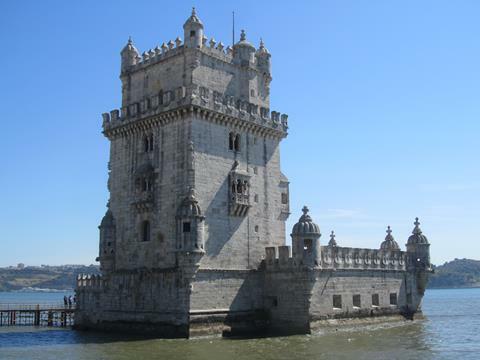 Belem Tower was built to defend the mouth of the Rio Tejo and Lisbon from invaders, particularly those	pesky Spaniards but also on occasion, the French. It dates back to the 16th century. 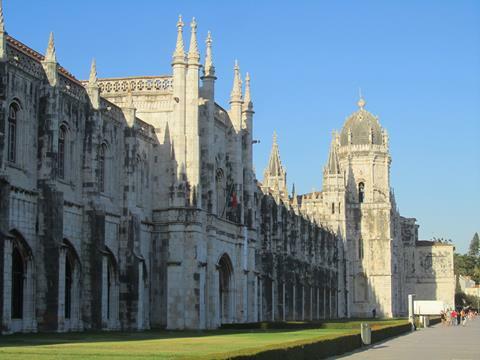 Not far from Belem Tower, Mosteiro dos Jeronimos is another local attraction and popular stopping point	for city bus tours. 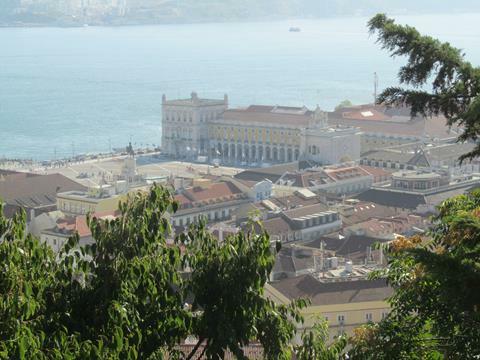 It is one of a number of world heritage sites in Lisbon, and is flanked by a	couple of rather decent cake shops. 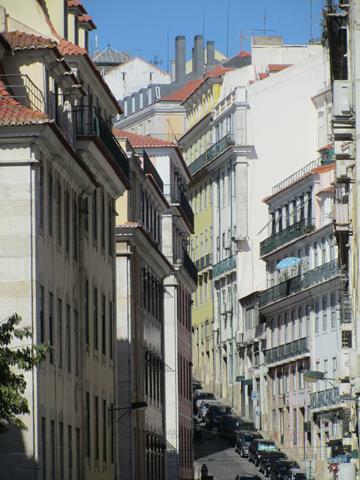 A typical steep street back towards the old town, leading from the waterfront up to Bairro Alto. 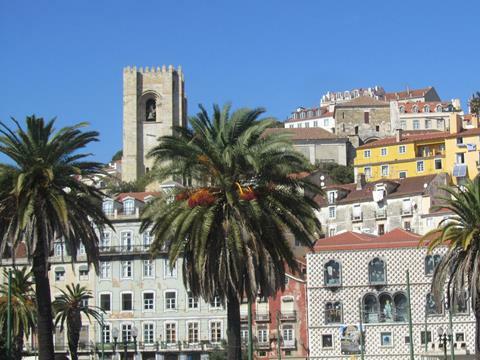 Colourful tiled buildings and church towers, mixed in with palm trees make up that pretty Portuguese look. 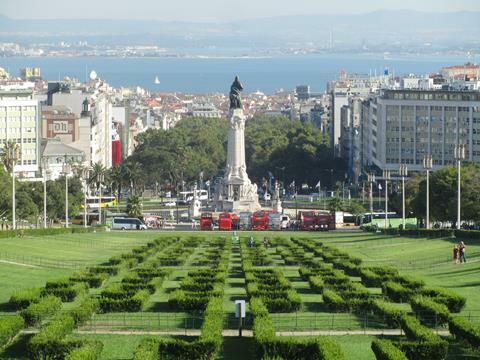 Parque Eduardo VII also affords great views across Lisbon, although it's a bit too far to walk from	Baixa or Chiado. I know from my uncle's cine film taken fifty years earlier, that these hedges have	been arranged thusly for a long, long time. 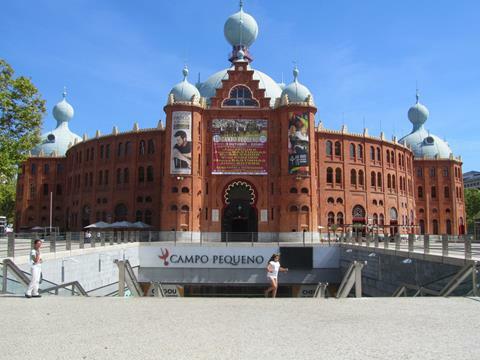 Campo Pequeno, the old bull ring, has been tarted up and now hosts a number of restaurants as well as	the occasional bullfight. It was conveniently just a block away from our hotel, the VIP Grand Lisboa. 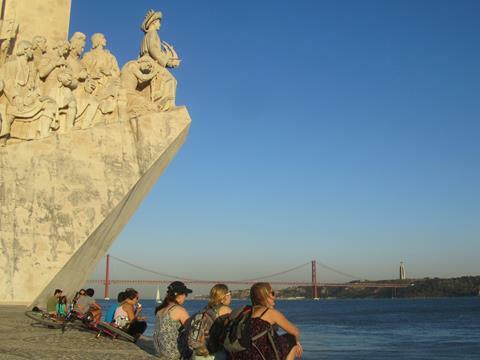 Down on the banks of the Tejo, Padrao dos Descobrimentos is a monument to the great age of Portuguese	discovery, including explorers such as Vasco de Gama and Magellan, no less. It was difficult to photograph the Ponte 25 de Abril from a moving tour bus amid lamposts and power	cables, but this was my best effort. Both decks and both sets of suspension cables are clearly visible. The statue of Christ the King in the background was inspired by his not-dissimilar cousin in Rio de Janeiro. 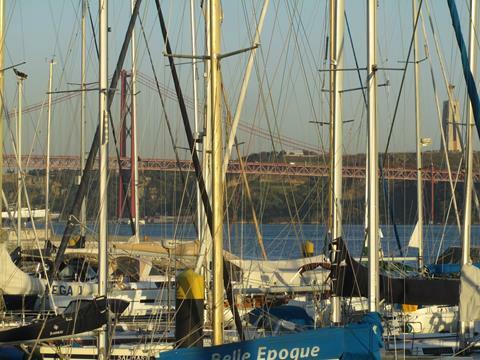 Boats bobbing in a small marina on the Rio Tejo, with the iconic red bridge behind. 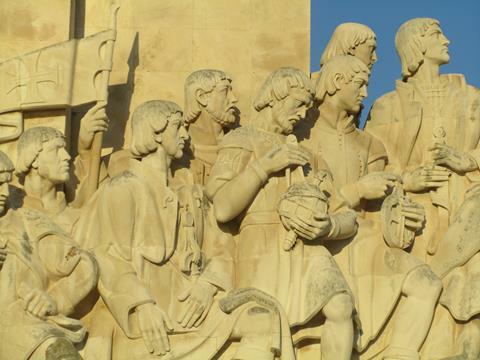 A close-up of the Monument to the Discoveries, with a selection of the explorers who opened up the world from Europe. Another consequence of old Lisbon's hilly demeanour, is the funicular railways that run from Baixa,	in this case up to Bairro Alto. This funicular is called Elevador da Gloria, but despite its long service	it is sadly not immune to vandalism. We went on from here to a very good tapas restaurant, El	Gordo.